With Pacific Seaplanes and Seair Seaplanes you will take an awe-inspiring flight over Vancouver Island from Vancouver and experience the beauty from above before arriving at our Resort to experience it from land and sea. You can fly directly from the seaplane terminal to our dock and we will take care of all the details, from booking your flight to arranging a shuttle to and from the terminal. Please call or email for pricing from Vancouver as well as information about flights from Seattle Washington. Drive through the breathtaking Cathedral Grove and arrive into Port Alberni where our water taxi will be ready and waiting for you at China Creek Marina. Stop for a bit to eat in Port Alberni or grab a picnic and enjoy it on edge of the dock before you embark on the scenic 60-minute cruise along the coast to the Resort. Water taxi pick up is included in all packages. 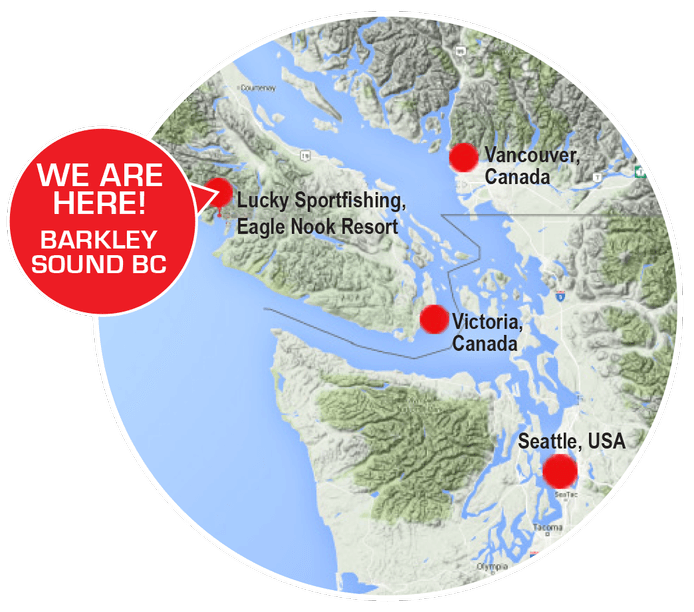 At Eagle Nook, our marina can accommodate boats and floatplanes of all sizes. Tie up at our dock and enjoy luxurious Resort accommodations and meals, plus full access to all the Resort amenities. We even have a helipad right out front; there are truly endless options to reach us. Call 604 357-3361 or email info@eaglenook.com for more information and reservations.